This MaxPipe™ black, quad-shield, single, RG11 coaxial direct burial cable has a braid coverage of both 60% and 40%, a copper clad steel center conductor wire and comes 1,000' per reel. The floodant gel (water block gel) makes this a great cable to use for buried drops. Product-specific information: Product details, Specifications, Dimensions. 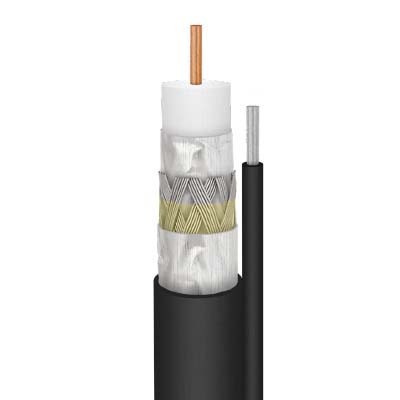 This black, single, RG-11 60% coax cable is UL Listed, has a copper clad steel center conductor, a galvanized steel messenger wire for aerial installs, is SCTE compliant, includes footage markers every 2’ and comes in 1000' reel. Excellent coax for all of your cabling needs! Product-specific information: Product details, Specifications, Dimensions. This MaxPipe™ orange, single, RG11 coaxial direct burial cable has a braid coverage of 60%, a copper clad steel center conductor wire and comes 1,000' per reel. The floodant gel (water block gel) makes this a super cable to use for buried drops. Product-specific information: Product details, Specifications, Dimensions. This MaxPipe™ black, single, RG11 coaxial cable has a braid coverage of 60%, a copper clad steel center conductor wire and comes 1,000' per reel. Outstanding coax for all of your installation needs! Product-specific information: Product details, Specifications, Dimensions. This Belden, black, single, plenum, RG11 coaxial cable has a braid coverage of 60%, a bare copper covered steel center conductor wire and comes 1,000' per reel. Product-specific information: Product details, Specifications, Dimensions.